This drawing was started at a State inservice drawing workshop for art educators in Delaware. Maybe this page should be titled "What I did on My Summer Vacation, 2013". Teaching Middle School keeps me busy most of the year, so I look forward to my time during summer break to explore and experiment with the ideas that are inspired by my teaching. "EMERGING": Color pencil, pencil, marker and presstype over inked mono-print. 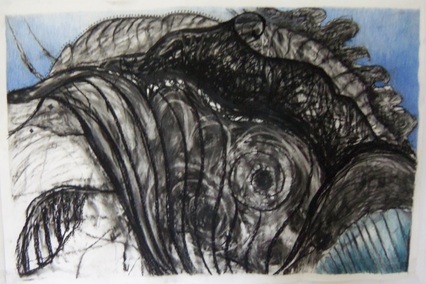 "PRIMAL DISTRESS"; Mono-print with charcoal, color pencil, pencil and press type additions. 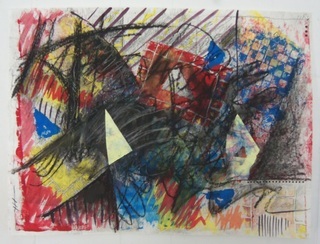 "HOT MESS"; Inked paper cut and woven with pencil, marker and press type additions. "WOVEN DRAWING BLUES"; Inked paper cut and woven with marker, pencil and press type additions.